Interested in marketing and positioning? You should probably check out a new book I’m writing with April Dunford entitled Different, Better—and sign up for our mailing list. When I was in university, I was convinced that advertising was all about clever turns of phrase. It’s an idea that’s reinforced on Mad Men: the perfect slogan can sell a billion cigarettes. But advertising—indeed, any kind of communication—is really about empathy: get the right message to the right person at the right stage in the buying process, and you’ll win. If I could do only one thing with a startup, this would be it. In some cases, the message map exercise sends companies or investors back to the drawing board to reconsider their entire offering. I’m going to show you how it works using the example of someone buying a new car. You can use this approach for nearly anything; the point isn’t to learn how to sell cars, it’s to think about the messages and collateral you’re creating in the context of your target customer. The first step is to understand the major milestones that a buyer must go through in order to decide you’re the right choice. Consider, for example, that you want to sell a Honda Civic hybrid. You have many arguments to make — that Honda makes nice cars; that a hybrid is better for the planet; that driving is a liberating experience. But if you simply spew out all those arguments, your efforts will be wasted. We know you’re not selling cars. Pay attention; this is about the process. Your product, and the milestones a prospect must clear in order to become a customer, will be obviously be different. But you must get this step right for your target customer. If you don’t understand the clear mental stages that separate a prospect from a buyer, get out of your office and don’t come back until you do. The complexity and format of the message you can deliver at a particular stage in the map changes significantly. Early on, you’re telling the world it needs a car—possibly through broadcast advertising. Later, however, you’re putting detailed specifications about a particular make and model into a printed brochure or web page. If you’re selling a technical product, you may find the stakeholder in the early stages is an IT operator or a developer, but later on it’s a CFO or an investor. The sales materials you offer them will be very different: a detailed white paper for the technologist, but a business case or an ROI calculator for the person signing the check. In other words, as the prospect moves from interest to purchase, the information they want and the tone you can take changes significantly. Prospects have different objections at different stages. 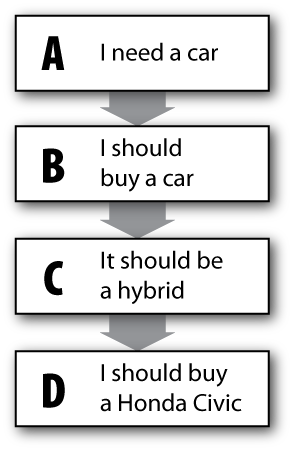 In stage (c), for example, the main objections are things like, “hybrids are too expensive” or “I don’t think a hybrid is powerful enough to drive.” So marketing messages need to focus on the affordability and power of a hybrid vehicle. As your target audience moves down the message map, they become more narrowly defined, and your messages can be more specific. 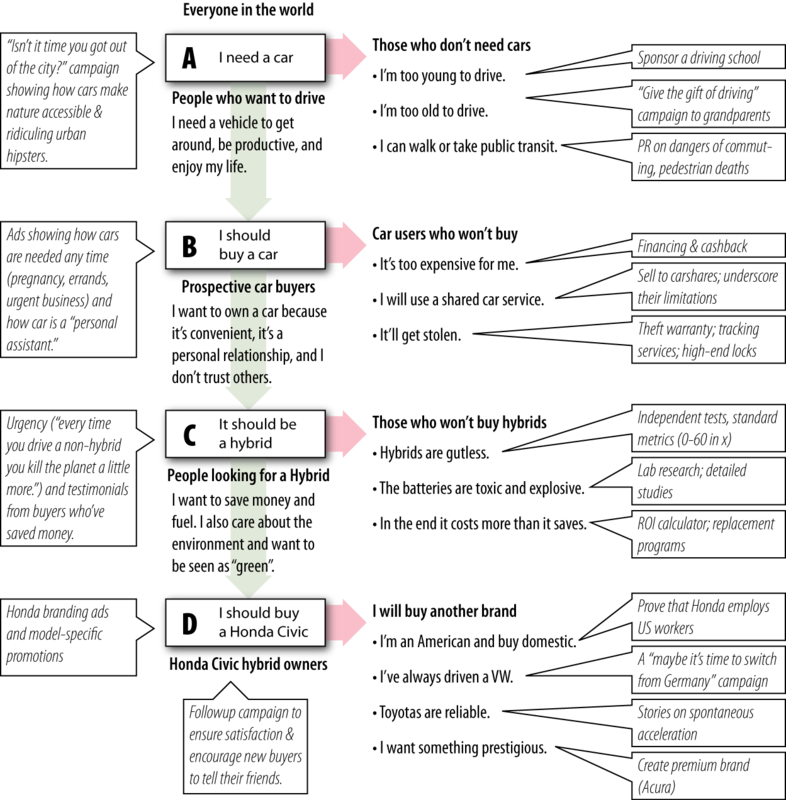 Your goal at each stage of the message map is to deliver the message that moves the prospect to the next stage by providing arguments—both rational and emotional—that overcome objections and encourage progress. It’s a good idea to write down what you think a nay-sayer will claim. This helps to make the stakeholder more real, and can be updated as you hear new objections during the sales process. As you can see, we have a much more concrete understanding of the sales process and the required arguments already. To be clear, we’re not endorsing all of these — predatory lending and making up stories on the dangers of walking aren’t a good idea. Any marketer has to create messages that are consistent with their overall brand. Notice how essential it is to match a response to a prospect’s specific objection. There’s no point telling someone stuck at stage C that hybrids are fast and powerful if they’re actually concerned about battery safety; in fact, it may hurt your marketing efforts. Targeting the right objection with the right message is critical. It’s not enough to overcome objections—you also need to reinforce motivations. That means understanding why prospects move towards the purchase, and creating urgency around those steps. Remember, we’re using the example of a car purchase to make a point. 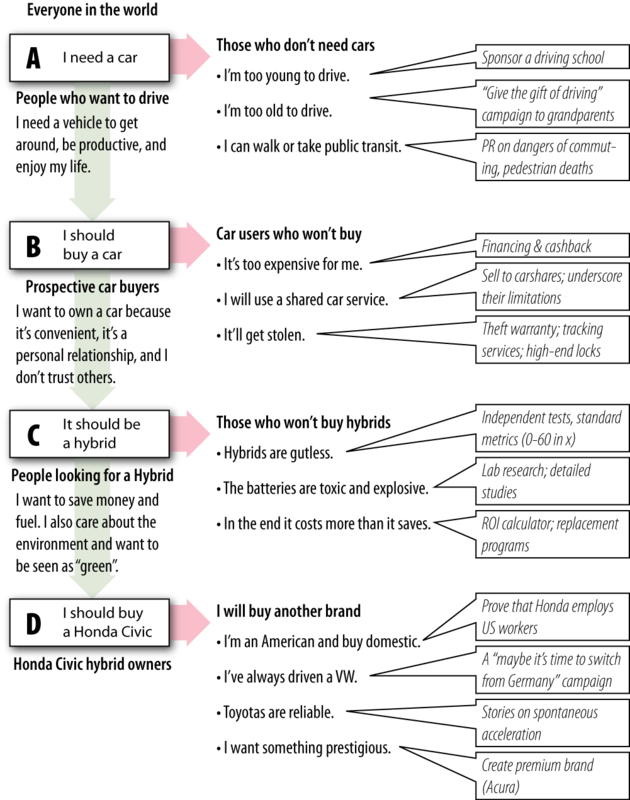 Cars are something most people are familiar with, so you can likely condense many of these messages into an ad. But when you’re selling a new product or service—or even introducing someone to a new website, from first visit to engagement—you can’t overlook this process of steps, objections, and encouragements. If we’ve done steps one through five properly, the collateral will pretty much write itself. We’ll know, for example, that we need to commission an independent test of road handling; or that we should launch a premium car brand, or that we may want to change financing terms. In each case, we know what objection we’re trying to overcome, so we can also test that hypothesis. 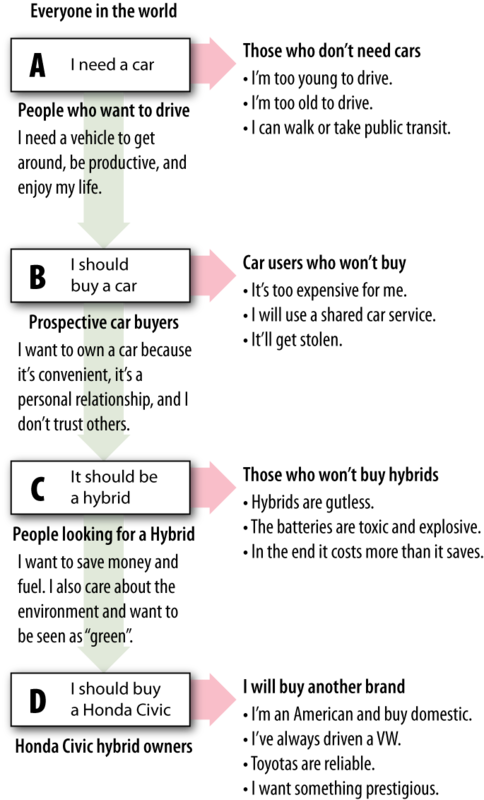 Did the independent test change public opinions of the performance of hybrids? Did the financing terms lead to more people considering buying a car? The collateral will be different for each stage. A motivated buyer in the later stages of purchase will seek out information, and they’ll want details. They may also prefer impartial studies, such as reviews or testimonials. Earlier in the process, subjective, brand-oriented appeals to lifestyle and self-image will work better. Larger fonts, different print publications, and a unique tone are probably appropriate for the campaign to grandparents. We often get asked to create a “marketing library.” This is usually a slide deck, a white paper, a positioning statement, some boilerplate copy for press releases, product spec sheets, and case studies. It’s as if everyone’s been programmed to ask for this list. Often, it’s wrong to do so. It forces them to answer the real question that’s so often overlooked: why are you doing this? If they do it right, the collateral and marketing materials become obvious. If they don’t know the buying process, the customer’s motivations, or the objections, it becomes painfully apparent. There’s no point making marketing collateral if you don’t know what you’re trying to accomplish with it. The message map reminds them that there’s no “silver bullet” that will magically make a prospect buy: it’s part of a process of engagement. Why should you use message maps? Simply put, because they help you sell things better, which is, after all, the point of marketing. Using a message map, the first thing you have to do is find out where in the process a prospect is at. You should quickly fire salespeople who don’t do this. Telling someone the advantages of a hybrid engine when they have no desire to buy a car won’t help; extolling the virtues of green when someone’s concerned about acceleration will hurt; explaining to someone how nice driving is when they’re already in your showroom is a waste of time. Great salespeople have an almost preternatural intuition about where the prospect is at in the buying process. They can often tell with just a few sentences where someone’s at in the buying process. Bad ones sell by rote, spraying messages at a prospect in the hope that one will stick. You should insist on a message map for every product or service you offer, and you should make it as up to date as possible. That way, every time you see a piece of marketing collateral, you’ll ask yourself, “which stage is this supposed to move prospects through, and does it accomplish that goal?” You can tie sales funnel reviews and web analytics meetings to it, too. Message mapping should be a fundamental part of your product planning and marketing communications efforts. Every piece of collateral—from calling scripts to web design to press releases to promotional videos—should fit within the map, and you should constantly seek to validate or correct the map to adjust to how your prospects buy your products. Thank you very much! I will apply this process to our products and see what conclusion I reach. The process seems to be very sound though. Can you explain how to tie sales funnel reviews and web analytics to it? Do you suggest one monitors the change before and after the map? Or do you suggest to setup certain goals? Fantastic article. Thanks for fresh ideas. I’m thinking that the first application of the message map is as a tool for sales to use to assess where the customer they are speaking with is in their buying cycle. That way they could speak to the current pains the customer is experiencing as a way to establish credibility and rapport. I think it would be a very interesting experiment to run the multi-message/multi-phase campaign to identify when best to use advertising to engage a customer with your brand. Too early: you’re doing expensive missionary work. Too late: the customer has established brand and feature preferences. Excellent read.Will try to apply it in online marketing. Congratulations.. very helpful, clear and objective message! Very useful. Funny how consistently that with almost any problem, breaking it down into the smallest particles makes it so much easier to get the outcomes you want. Thank you for this excellent post. It has been very helpful in building a picture of the way in which we need to approach marketing our services and products. There are three kinds of CEO. If you run a startup, you’re one of them. And therein lie your strengths and weaknesses.